To sign our bee plight petition, Download Petition.pdf . Southbank Centre and Slow Food London have collaborated to create a special 4 day event championing great food, the environment and sustainability from Thursday 18th – Sunday 21st September from 12.00 - 21.00 daily. The Festival of Food will feature a range of events including the UK’s largest and London’s only Slow Food market, an eclectic programme of talks, demonstrations, a photographic exhibition celebrating the craft of bread-making in Britain, a Bee Day, and live music and performance throughout the weekend. Southbank Centre Square, outside the Royal Festival Hall will be home to the UK’s largest, and London’s only Slow Food Market where over 40 stalls selected by Slow Food London will sell sustainable and traditionally prepared foods from a selection of the UK’s leading artisan food producers and beyond. The Slow Food Movement believes in food that is Good (delicious), Clean (environmentally sound) and Fair (fairly traded). One of Slow Food’s aim is to protect the regional and local distinctiveness of foods around the world. At the festival visitors can taste and buy produce that is truly unique to Britian - pedigree and rare-breed meats, raw milk cheeses and ‘true’ Perry - alongside a host of other delicious foods ranging from exotic spices and chutneys to biodynamic wines and real ales. The Slow Food stalls will wrap David Adjaye’s ‘Sclera’ pavilion constructed from sustainable tulip wood and designed as part of the London Design Festival. Download the Brochure for full details of the programme here. The festival is not just about tasting, buying and eating real food but also learning what you can do with it. Farmer and butcher Peter Gott, a long standing member of Slow Food and passionate about educating people about quality food and food production, will give a guide to buying and using cheaper cuts of pig as well analysing the economies of unintensive pig rearing. Talented cook and Slow Food devotee Sarah Moore who ran the restaurant at the legendry Air Studios for 12 years, will show people how to cook tasty, seasonal and nutritional dishes for under £5. Arthur Potts Dawson leader of the crusade in eco-friendly restaurants and executive chef and co-owner of Acorn House will showcase some delicious ways to enjoy selected autumnal ingredients. Cyrus Todiwala, from Café Spice Namasté, and Jacky Lelievre, from celebrated gastropub The Butcher’s Hook, will visit market stalls to select produce and then show how to make simple, seasonal and cost-effective dishes. Sushi chefs from Feng Sushi who only use impeccably sourced, sustainable fish will demonstrate some easy to replicate sushi techniques. Thursday 18th September 17.30Hattie Ellis, winner of this year's most sought after award, the Guild of Food Writers’ Derek Cooper Award for Campaigning and Investigative Food Writing, has shone a light into the darkest corner of global poultry practice in her latest book Planet Chicken, The Shameful Story of the Bird on Your Plate. Her insightful and thought provoking talk will highlight both the exploitation of the world’s best-loved bird and also discuss ethical producers who are putting real chicken back on our tables. Thursday 18th September 18.30 Geoff Andrews, writer, academic and author of The Slow Food Story, will talk about the movement’s history, ideas, structure and membership exploring its roots within 60s and 70s counter culture and the distinctive politics that lie in the unity of gastronomic pleasure and environmental responsibillity. Through a research project with tutors and students from the Brighton University Centre for Research and Design over the coming autumn, Southbank Centre will be exploring the potential for growing and greening the site with local people. This talk by Andre Viljoen publisher of the book Continuous Productive Urban Landscapes (CPULS) maps out the strategy for the research project and features details of other growing schemes around the UK. John Dickie, reader in Italian Studies at University College London has written articles and books on many aspects of Italian history. He will discuss his new book Delizia! which reveals that Italian food comes not from the peasantry but from city culture. His talk takes visitors on a journey around Italy and Italian history, from 12th-century Palermo to the Slow Food movement of modern Turin via the immigrant slums of New York and the putrid alleyways of 19th-century Naples. Authors and urban bee-keepers Alison Benjamin and Brian McCallum discuss their new book examining the plight of honey bees. Colony Collapse Disorder is a mysterious 'disease' that is killing honey bees. First reported in the USA it has now spread across the planet. So intrigued were they by this mysterious plague that Guardian journalist Alison and Brian spent four months investigating the phenomenon. From Argentina to Australia, New Zealand to New England, China to California and most of Europe they gathered the latest information from the scientists, apiarists and government officials, piecing together the facts and dismantling the rumours, to arrive at the most up-to-date account of the global problem afflicting the honey bee. Sue Clifford, co-founder of Common Ground, an organisation which campaigns to link nature with culture and the postiive investment people can make in their own localities, will discuss both this organisation and her wonderful title The Apple Source Book in her talk ‘Apples, Orchards and Community Orchards’. Her book is a celebration of the nearly 3,000 varieties of apple grown across the UK, their distinctive flavours, uses, places of origin, stories and associated customs. Patricia Michelson, a leading authority on cheese, discusses the delights of cheese and demonstrates how make to fondue and serve Raclette. Patricia is the owner of La Fromagerie, a cheese emporium based in London’s Marylebone, one of the best-loved cheese shops in Britain. Her much celebrated book The Cheese Room won the Best Single Food Subject Award (UK) in the 2002 Gourmand World Food Book Awards. Wild Honey Bees are in real danger since the arrival of the verroa mite in the early 1990’s. Other environmental problems appear to have a similarly devastating effect. Honey bees are crucial to us all; a third of the food we eat requires insect pollination. Saturday will be dedicated to the glorious honey bee. Peter James, Beekeeper at Chelsea Physic Garden, will bring along a ‘dry hive’ and run a ‘Bee and Q’ session: all you wanted to know about bees but never thought to ask! Orchard Apiaries’ Mike Thurlow will display his observation hive section so you can see his bees in action, whilst he demonstrates some of the techniques of beekeeping. He’ll also run a beeswax candle-making workshop for children (and no doubt keen adults). Learn some practical steps to support your local honeybees in their fight for survival through this talk and demonstration by the London Beekeeping Association. Throughout the day on Saturday Slow Food London will be conducting comparative honey-tasting sessions: the range of flavours is truly amazing. There will also be an opportunity to register your concern about the plight of the honey bee by signing Slow Food London’s petition, demanding that the government through Defra increase and expedite urgently needed funding to investigate all the contributory causes of colony disease. To sign our petition, Download online_petition.pdf . In the spirit of Slow Food, visitors will be encouraged to ‘slow down’. Lay back and enjoy a ‘slow’ dj set by the glamorous Shellac Sisters playing 78rmp records on 1920s wind-up gramophones. Celebrated British folk band Bellowhead, food lovers and Artists in Residence at Southbank Centre, will bring their Bellowsession to the Slow Food Festival. Guests are invited to bring along an instrument, and, having learned the song online in advance, jam along with the folk wizards. Marvel at the Brighton Morris Men who help keep part of England's history and heritage alive with their dance displays. Gauri Sharma Tripathi Artist in Residence will perform ‘Flavours in Emotions’. South Asian culture has always been heavily rooted in food and dance and Gauri celebrates the beauty of this combination in a short Kathak dance piece that will be performed throughout Saturday. Carrot Club, Busy Bee Tent, Southbank Centre Square, Friday 19th September, 13.00 - 15.00. Younger children can join in at Carrot Club, a participatory parent/toddler (for children aged 2-5yrs) group that encourages playful interaction on themes of food and growing through music, arts and crafts. Be a Bee, Meet at the Busy Bee Tent, Southbank Centre Square, Saturday 20th September, 13.00, 15.00, 16.00. How do bees navigate and communicate? Kids can find out by becoming a bee and buzz around the Southbank Centre looking for pollen. Kazoos will be provided! Slow Art, Busy Bee Tent, Southbank Centre Square, Saturday 20th September 12.00 - 16.00 and Sunday 21st 12.00 - 16.00. Children and their families can drop into Slow Art Tent and try their hand at creating a visual feast; art activities will celebrate the beauty and versatility of food! Try your hand at Snail Racing! Festival of Food is a non ticketed event; entry is free to all visitors. 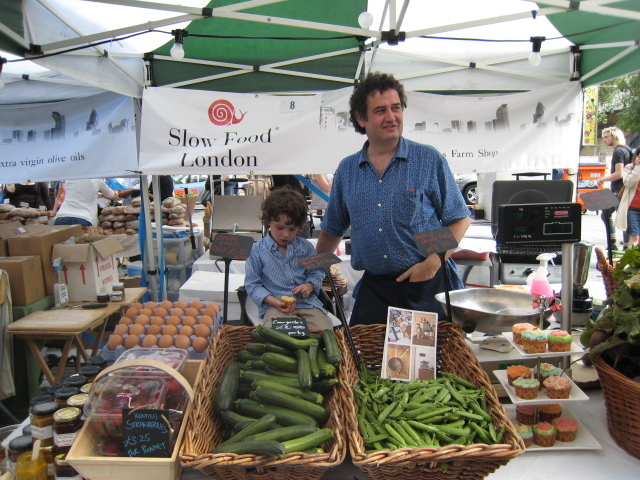 Slow Food is a non-profit, eco-gastronomic, member-supported organisation that was founded in 1989 to counteract fast food and fast life, the disappearance of local food traditions and people’s dwindling interest in the food they eat, where it comes from, how it tastes and how our food choices affect the rest of the world. The Slow Food movement aims to support small-scale producers who preserve the diversity of crop varieties and animal breeds, of agricultural practices, and of food traditions. It believes that the food we eat should taste good; that it should be produced in a clean way that does not harm the environment, animal welfare or our health; and that food producers should receive fair compensation for their work.